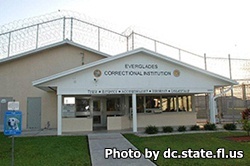 Everglades Correctional Institution is located in Miami Florida, part of Dade county. It is a level V facility that houses approximately 1,790 adult male inmates. The custody level at this facility varies from minimum to closed custody. Inmates have access to educational classes where they can earn an adult basic education, GED and learn to read. Currently, Everglades Correctional Institution does not offer any vocational courses. Services run by the chaplaincy at this facility include: Alcoholics and Narcotics anonymous, religious studies, bridge builders, and worshiping services. This facility currently offers no PRIDE assignments or community work. Before you visit, be sure you have filled out a visitors application and had it approved. This process can take up to one month. Visiting hours are on Saturdays and Sundays from 9am to 3pm. You can arrive at the facilities parking lot no earlier than 7:30am. Registration for visiting begins at 8:15am and ends at 2pm. Anyone arriving after 2pm will not be allowed to visit.